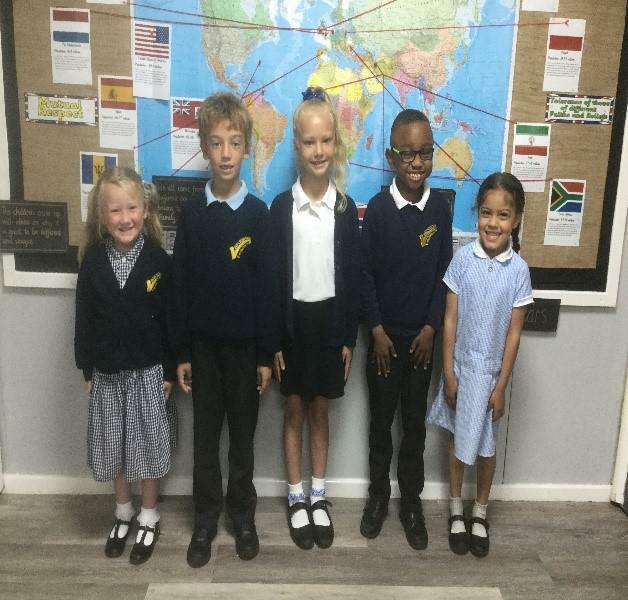 Everyone at our school wears school uniform which was designed by the pupils. It looks smart, helps children to have a sense of belonging and pride in our school and presents a positive image to the wider community. Reversible coats and fleeces in navy, navy polo shirts, and book bags are also available – all with our school logo. Sample sizes are available in school and order forms are available from the office. Outdoors –track suit, or leggings and sweatshirt, T-shirt, plimsolls or preferably trainers. Our uniform suppliers do provide a bargain PE package with a bag. However, track suits and jogger bottoms and bathers are available more cheaply from large local supermarkets. All uniform is marked with your child’s name. Young children wear easily fastened coats and shoes. Shoe lace tying is a skill learned and practiced regularly at home! Please note: If children arrive in school wearing incorrect uniform, then parents/carers will be notified. If this persists (3 times consecutively), then it will result in the child concerned receiving an after school detention. If you have any concerns regarding uniform then please speak to your class teacher or see the Headteacher. Jewellery wearing is not encouraged in school. Children may only wear a watch and a single, small, stud ear ring in either ear. Any other piercings are not acceptable. Jewellery must be removed for all PE, sport and swimming and it is best if this is done at home. We advise parents to schedule ear piercing for the beginning of the six weeks holidays so that they have time to heal before school starts. School will accept no liability for any items of lost jewellery. The wearing of make-up and nail varnish is strictly prohibited. If this is breached, then your child will be asked to remove it and parents and carers will be notified. Please ensure that any bows or bands are of appropriate size - no bigger than 2 inches for bows. Large Jo-Jo bows are banned and your child will be asked to remove it. Long hair should be tied back. We do not allow shaved sections of hair.